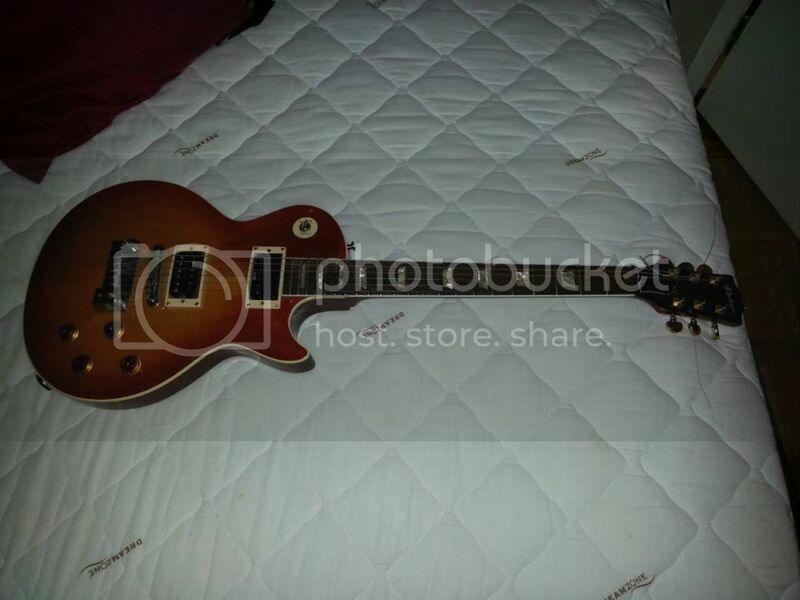 Tokai Forum - a subsidiary of TokaiRegistry.com :: View topic - Need help, mystery Les Paul, really odd!!! 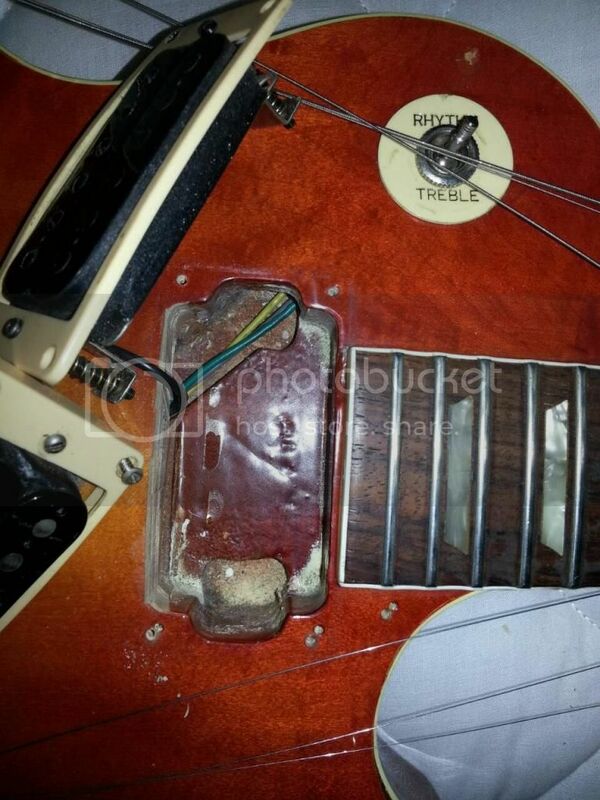 Need help, mystery Les Paul, really odd!!! 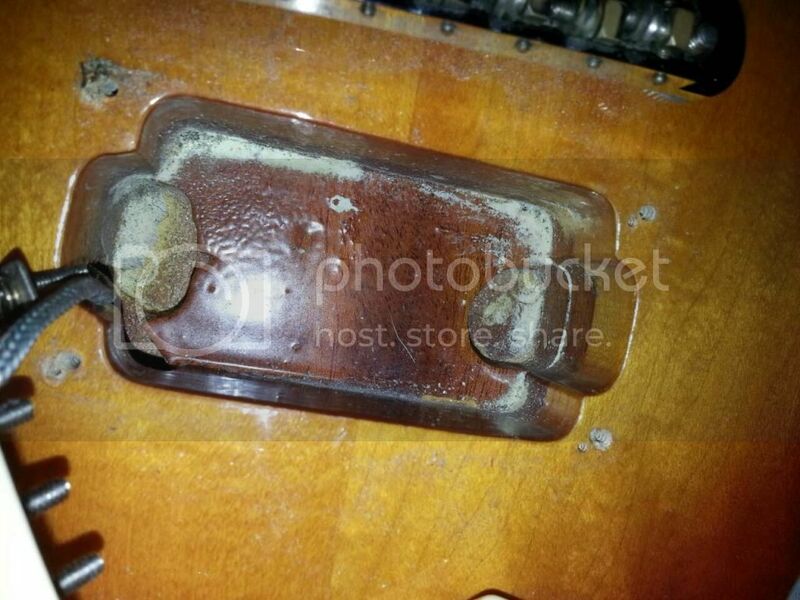 Posted: Sat Jan 17, 2015 5:42 am Post subject: Need help, mystery Les Paul, really odd!!! Hi all! Im new to this site and forum. But it seems really nice. So, i got a mystery LP that is extra hard to get info about. The reason is in the name of the LP. And before i spell int out, it is NOT the current comapny with same brand name that makes LP repilcas, i had my guitar long before that company started and the logo is different. Also, it is NOT vantage, it is VINTAGE. As i said, not the current vintage brand since this LP been with me since around 1990, and had at least one owner before me. So you can imagine how hard it is to google a vintage, vintage LP repilica that is not the current vintage LP repilca. Anyways, definitly older than 1990. Vintage logo is in mother of pearl. It is a rather exact replica, so the logo is exactly like the original. Also the shape of the headstock, the fretboard inlays (like standard, not custom) and the body shape are exact replicas. 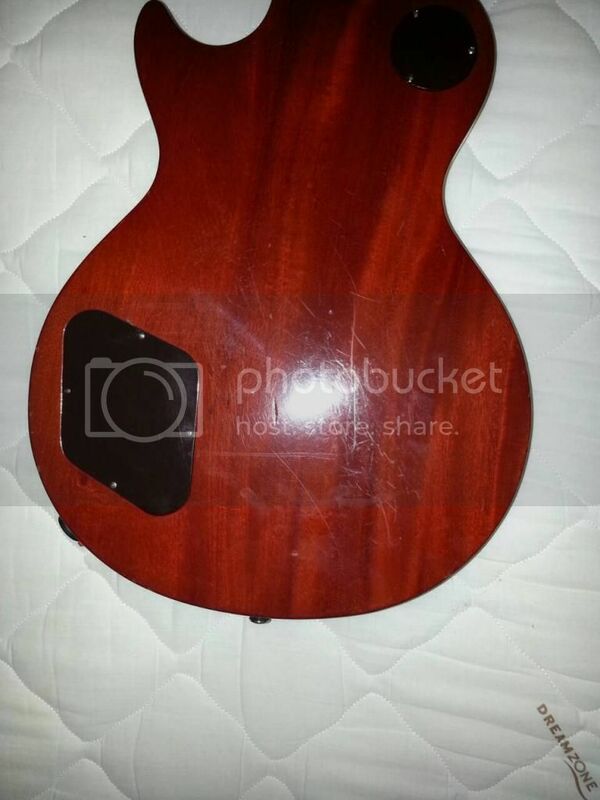 It is a one piece solid mahogany body with i guess a maple top. The top is very natural, not quilted but rather like a violin. 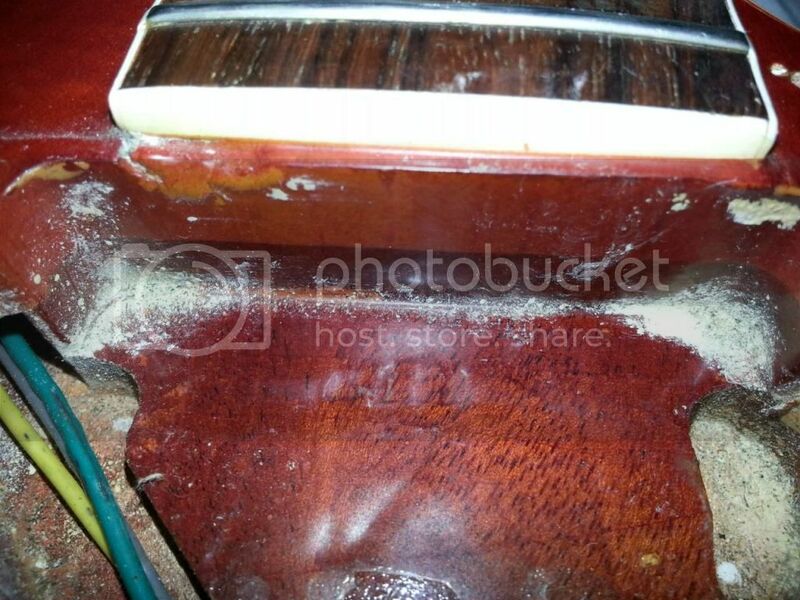 Glued mahogany neck wich is one piece except sides of headstock. 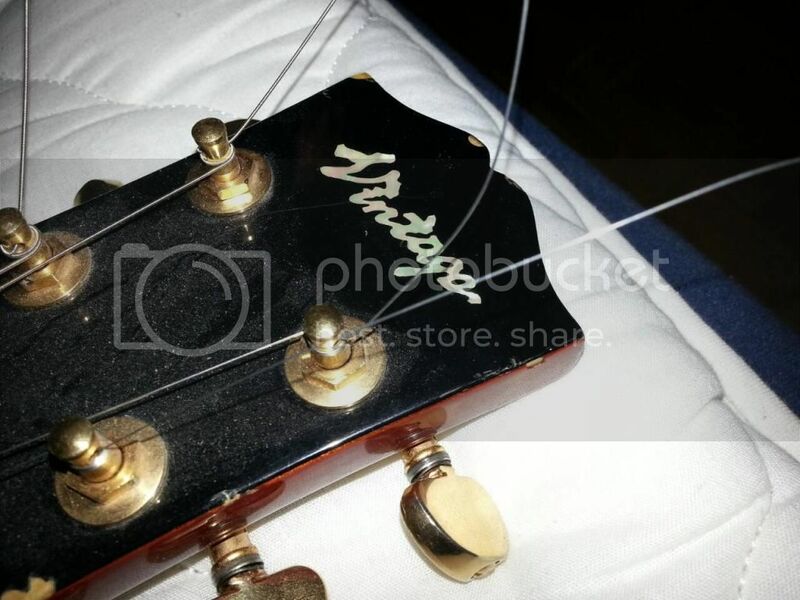 There have been some obvious modifications like tuners, pickups (SD 59 might be original, i have no clue. I have 1 PUP that came mounted left) The chord connection is of locking type, not original. Pickguard is gone.. and it has a graphite nut and some spring loaded trem where the string anchor is on a regular LP. Any ideas? Can i post pics? I have no idea about the guitar (I'm aware of the current "Vintage" brand, but like you said, I suspect yours is from before its time), but I appreciate the difficulties you have in trying to google "Vintage"- it always annoys me when a company I'm interested in has a very generic name like that because, as you said, it makes it virtually impossible to google for any information like reviews, forum posts etc. Here's a better description of how to post pictures. 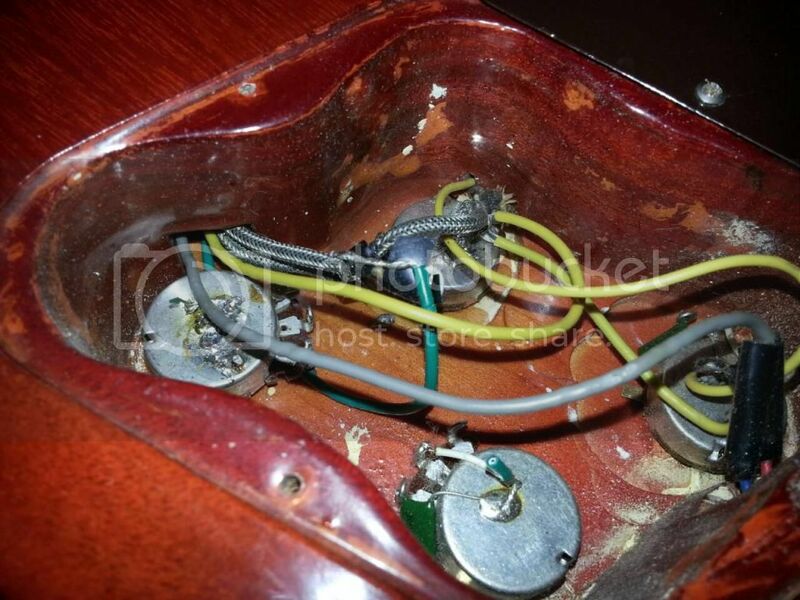 Yes please post some pics of both pickup cavities, control cavity, tenon, etc. If it's Japanese this can be concluded from routing. Yep, copy the IMG code. 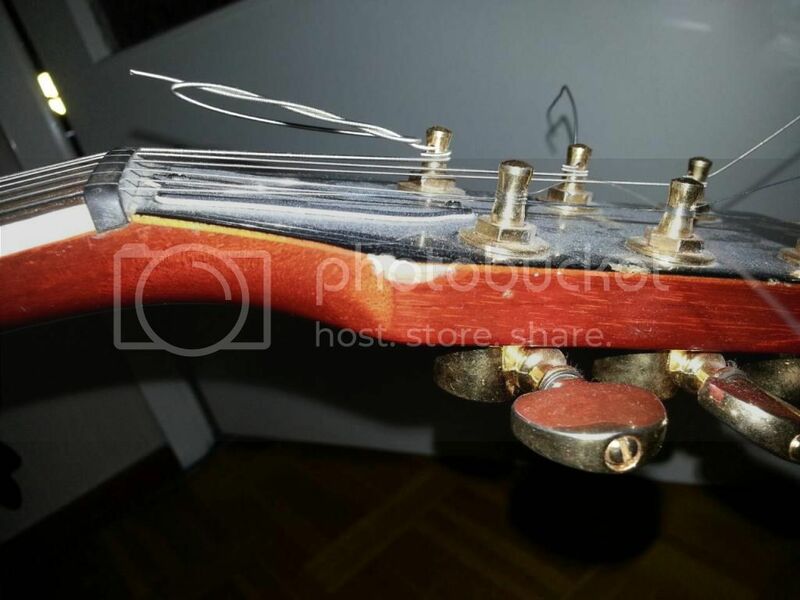 Interesting guitar, thanks for posting pics. Though I can't pinpoint this guitar to a certain factory, I'm leaning towards late 70s Japanese made. It's a 1977/1978 Kasuga type made guitar. The reason I'm thinking Japanese is because of the fret edge binding and very similar build quality to known Japanese factories. Late 70s because of the (non visible) short tenon, the green/yellow wire colour which was often seen during the 1977-1980 period and what seems to be pre CNC routing. The problem with the late 70s is that most Japanese factories were changing their production process, resulting in gradual changes in the way they routed their guitars. Also there were still many factories active and most of them produced under OEM. 1. Do the pots say 'Noble' on the side? 2. 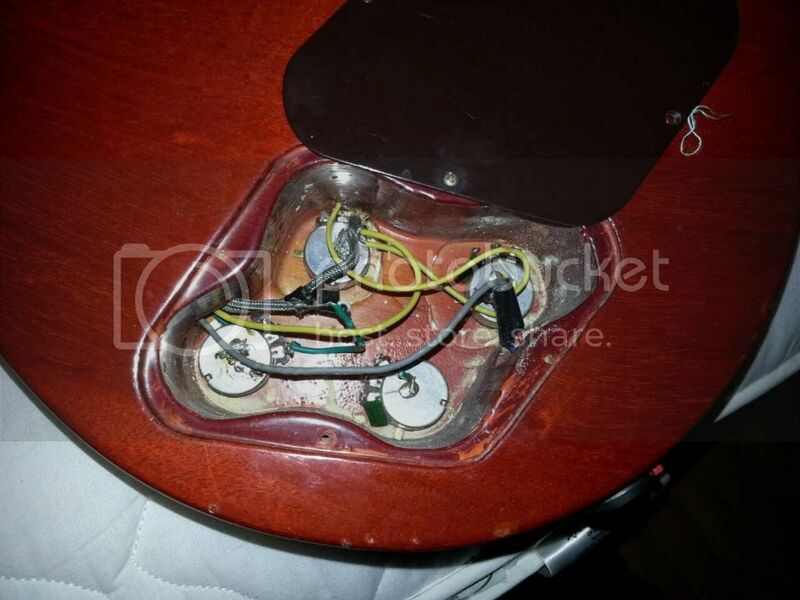 Are those digits in the neck pickup cavity? When you are holding the guitar upside down, does it start with 77? 3. Is the back & neck made of maho? Looks like bass wood to me?? 2: Seems to be, although covered with goo so very hard to make anything out of it. Id guess those are 7's as u say. 3: Yes it seems to be mahogany. 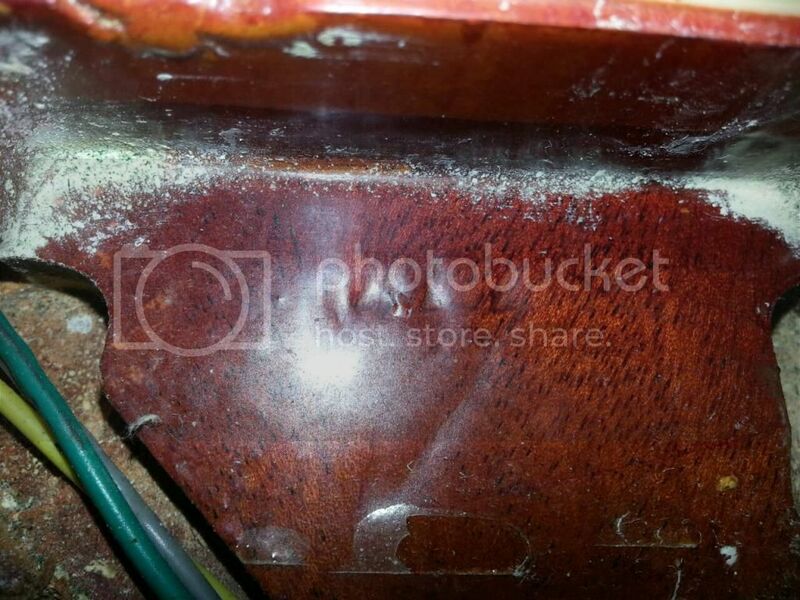 Im no expert but wood seem very reddish and dark, even where the laquer is worn off. Also the pores are kind of big as in mahogany and the body have no lines as seem to be the case woth some basswood. But then again im no wood expert. Is there a way to tell? 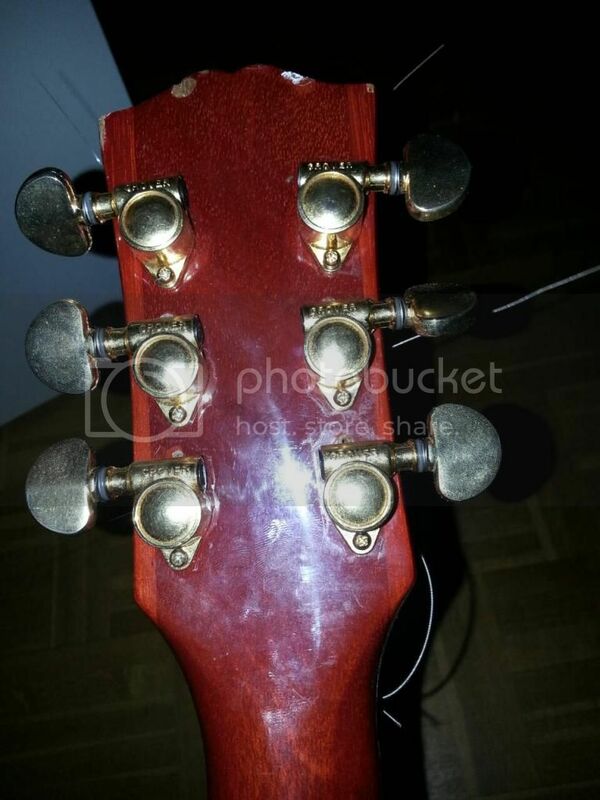 Top of the back of headstock have some worn off if i capped that in the pics. If not i can post a new one. Can you or someone possible tell anything more about it? Kasuga? Is that any good? I have never seen a "vintage" logo in any of the listings from Japanese factories, or elsewhere except for the current vintage, but they assured they did not make it. Hiall! So, no more clues about the "Vintage" brand, so that will be a separate thread coming up. BUT!! I found the one original PUP that came with the guitar! Its: PAT NO. 2,737,842. Stamped, no decal. Reading about it and taking a closer look it is a chrome covered "T-top" (black inside) with a 2 and a 3 inprinted in the plastic coilpieces between the first poles. A Gibson T-top original PUP! Made between 1976 to 1980, wich should date my guitar somewhere inbetweeen i guess. Any more clues? Or it's a MIJ T-Top lookalike often seen during this period. It har the PAT NO. 2,737,842 stamped and i havent seen any MIJ pup done that, also the hole markings between poles are the same as Gibson. I have no idea about the guitar (I'm aware of the current "Vintage" brand, but like you said, I suspect yours is from before its time), but I appreciate the difficulties you have in trying to google "Vintage"- it always annoys me when a company Douche plain-pied I'm interested in has a very generic name like that because, as you said, it makes it virtually impossible to google for any information like reviews, forum posts etc. I have already seen this model but I do not know where it comes from. But I would like to play with it.